Whatever made me think around the clock daylight would be a good thing. It sounds like so much fun. Spend all day sightseeing and then party on through the night. No sunset, no evening, no need to go to bed. Hang on, this is me talking. Anything less than eight hours sleep and I'm a total wreck. Round the clock daytime was never going to work for me. For a couple of weeks in late June, the city of Whitehorse in The Yukon, Canada has 24 hours of daylight. It is about as far south as you can get and still manage a taste of the 'midnight sun'. Take my advice - don't bother! The only thing all that daylight does is make it difficult to sleep. After several nights spent chasing down every crack in our hotel room curtains and still tossing around fitfully I finally resorted to a sleeping mask. That helped a bit, but frankly I have decided this midnight sun thing is seriously overrated. We were having dinner one night looking across at this aeroplane fixed on a stone cairn. David announced it was moving. I thought the midnight sun had got to him but it turned out that the plane is a weathervane and does indeed move in the wind. Whitehorse is our first stop on the Alaska highway. We are in a world populated by RV's, pick-up trucks and laundromats. The tourists are in the RV's, the locals are in the trucks and just about everybody is in the laundromats. The term 'RV' is short for 'recreational vehicle'. In Australia we call them campers. In Australia they are about the size of a 4WD (SUV), sleep between two and four people in basic comfort and are sufficiently manoeuvrable to navigate almost any road. Sometimes they might have a couple of bicycles on the back. In Nth America an RV is as big as a tour bus, sleeps the entire population of Tasmania in total luxury, can't negotiate anything trickier than an inter-state freeway and tows a car. Yes, you read that right, 'tows a car' - often, not even a small car. Occasionally a boat or disability scooter will also be tacked on the back. I am sure it is just the camera angle, but the car being towed here looks bigger than the RV doing the towing. This guy has transport for every occasion - RV at the front and mobility scooter at the back. You never know when a golf cart might come in handy? I couldn't resist one more photo - you can't really see it but this RV is also towing a car. We left the Alaska Marine Highway and joined the mainland road system at Haines. For my posts on the Alaska Marine Highway and our journey so far click - here. From Haines we drove north to Whitehorse where we joined the Alaska Highway. The highway starts at Dawson Creek in British Columbia and ends 155 km south of Fairbanks in Alaska. Strangely, for a road with the word 'Alaska' in its name much of the highway's 2,000 km length runs through Canada. The name Alaska Highway is more a product of history than geography. The road was constructed in 1942 by the US army to connect Alaska with the lower 48 states in the face of Japanese threats of invasion in the Aleutian Islands. Canada agreed to the construction, provided the highway became Canadian property once the war ended. When the US army was finished building the Alaska Highway they simply abandoned many of the trucks and other road building equipment they used. The machinery is still there, beside the road, like permanent time capsules. Whitehorse is the northern most point on our road trip. Canada's northern Yukon Territory and the vast interior of Alaska will have to wait until another time. At Whitehorse we turn right and head south, back toward Seattle. The Alaska Highway is populated almost exclusively by RVs. For every other vehicle on the highway there must be twenty RV behemouths, all headed north, in some lemming-like right of passage for North American baby boomers. We feel very much as if we are swimming against the tide. With motels like these it is hardly surprising all the tourists are in RVs. Whitehorse has been a lot of fun, which is good, because we don't know it yet but we have several days and many thousands of kilometres of nothing but pine trees before we again hit anything which might remotely be described as civilisation. If I were to sum up the most disappointing thing about south-east Alaska and the Alaska Highway I would unhesitatingly say the scenery. I imagined snow-capped mountains, glaciers and wild animals. While we saw these occasionally, mostly we got pine trees - mile upon mile of pine trees. Whitehorse however far exceeds our expectations. A modern day frontier town, it has a lawless, free-spirited atmosphere. It is easy to imagine living by your wits, hoping to strike it rich in the Yukon gold rushes. Fans of the Discovery Channel show Gold Rush will know that the gold rushes are still going on today - David says Tony Beats would not have spent a million dollars on a gold dredge if there wasn't good money still to be made. On one of our three nights in the city we immerse ourselves in the spirit of the Great Klondike Gold Rush of 1898 by attending a performance of the Frantic Follies; a turn of the century vaudeville revue. The night begins badly. We find ourselves queueing, or crowding, it's hard to tell which, in a hallway outside a rather ordinary looking function room at the Whitehorse Hotel. Everyone except David and I appear to be well over 70. There are several large bus tour groups, seating is first come first served and we are a long way from the front of the line. We consider abandoning the whole idea but the young man who sells the tickets assures us there is not a bad seat in the house. He turns out to be wrong, there are plenty of bad seats but it doesn't matter, somehow we get lucky and score a couple of seats in the second front row. The chairs are those fold down vinyl covered seats connected together in rows so that it is impossible to alter the distance they are apart. They are far too narrow and close together for the substantial frames seated on most of them. I lose half mine to overflow from the man seated next to me when I duck out to the loo just before the show begins. Fortunately by the time I get back David has re-claimed enough territory for me to be comfortable. From the moment the curtain rises, too narrow seats, chaotic queueing and trespassing neighbours are all forgotten in a fabulous hour and a half of fun and laughter. The chorus girls perform impossibly high can-can kicks, the pianist plays honky-tonk, the master of ceremonies delivers hilarious lines in a deadpan monotone and when the curtain finally falls we are sorry to leave. A symphony concert Yukon style - notice the 'instruments'! They are playing saws as if they were violins. At Whitehorse I finally see a moose. We have to cheat a bit and visit a nature reserve but it is still exciting. The Yukon Wildlife Preserve, half an hour from the city, has photos of moose with magnificent antlers highlighted in its brochures and website. While the preserve also has eagles, mountain goats, caribou, bison, muskoxen, bighorn sheep and others, it is clear that the moose are a drawcard. When we first arrive I ask the lady behind the ticket counter where the best spot to see the preserve's moose is. She groans audibly, and shrugs before pointing to the moose enclosure on a walking map. "We only have two moose, a female and a young male. Look toward the trees at the far end of the enclosure. They will probably be seeking shelter from the heat. It will help if you have binoculars. You may be able to spot part of an antler?" Why do I have the impression she has delivered this same disappointing news to countless visitors before us. At least I have had the forethought to bring binoculars. Predictably, at the moose enclosure there is not a quadruped in sight. David waits with good humour while I scan every tree and blade of grass for one of these elusive animals. He passes the time by chatting to an American couple who are also there to see the moose. They give up and wander off in the general direction of the caribou enclosure. We finally follow them. The caribou are lots of fun, as are the lynxes and arctic foxes. Many of the animals are almost as difficult to spot as the moose. We agree that the wildlife preserve has gone a bit too far in its efforts to create natural surroundings. However we get lucky and hit feeding time at more than one enclosure. The best animal by far is the muskoxen - a prehistoric looking creature resembling a cross between a bison and a wooly mammoth. If I hadn't seen them with my own eyes I would not have believed they could have survived the last ice-age. Muskoxen - Are these guys prehistoric looking or what? We are walking back to the car, past the near corner of the moose enclosure when I think I spot a moose in the distance. It is a long way away with its head down munching on some plants. We approach slowly and quietly, trying not to scare it. Disappointingly, it does not have antlers. It must be the female. For a few precious moments we watch her before she looks up to see us and then retreats toward the cover of the trees. It is not quite the 'later to be bragged about' encounter with one of these magnificent creatures which I had imagined, but it is still pretty good and at least I can finally say I have seen a moose on this trip. The SS Klondike was the largest of the sternwheelers to carry goods and passengers on the upper Yukon River between Whitehorse and Dawson City in the first half of the 20th Century. A sternwheeler is a paddlewheeler with a single wheel at the stern rather than on each side. Today the SS Klondike is a National Historic Site sitting high and dry beside the river in downtown Whitehorse. Entry is free and enough of the interior of the ship is open to visitors that you get a good idea of what it must have been like to travel in the days of the river boats. We were a bit pressed for time when we visited Miles Canyon. The canyon is only half an hour from Whitehorse but we didn't discover it until late on our last day. I'm only mentioning it now because I want an excuse to show my photos. If you do go to Whitehorse make sure you don't make the same mistake we did and leave it until last. It is a stunning area for walking and cycling. It is a great place for a road trip - but be warned - you will see a lot of pine trees. Thanks - It is amazing how many people have Alaska on their bucket list. I have heard of White horse i think from ice road truckers, a show i love. All day light would be interesting.We were amazed that the sun stayed up until 10.30pm in Spain, and slightly disconcerted. Even in New Zealand, the sun stays up really late but that may be to do with Queenstown being slightly off centre for its time zone. I like daylight until 8 or 9 pm, after that I just find it weird. When you get it right through the night like Whitehorse it is bizarre. I must dig out some old episodes of Ice Road Truckers - I've seen the odd ten minutes or so here and there but didn't realise some episodes were set in Whitehorse. Gorgeous place. Ever thought about going back in December for 24 hours of darkness to see the contrast? Haha - I would just love to go in winter but much as David would go almost anywhere for me I think he would draw the line at northern Canada in winter. That last one looks more like a recording artists tour bus. I would love to ride in one of those. I would like to see how it is with sunlight all day and night. Honestly - the 24 hour sunlight thing is just exhausting - lol. Hahaha! I was talking with a friend who just got back from Iceland and I was asking how much she loved the midnight sun. She glared at me and proceeded to tell me that she did.not sleep for the entire trip. I guess it's one of those things that sounds better than it actually is. Do you think it will be the same long daylight in August, Lyn? I'm going there next week. I love it when night never comes. I'd probably stay awake 24 hours if it was up to me. That muskoxen looks amazing, I hope I'll see one. I think I read that the longest days are in late June but I'm sure that in August the days will be almost as long. We saw the muskoxen at the Yukon Wildlife Preserve. I wouldn't be too stressed about getting there but we found it interesting for a couple of hours. It's really just a large open-plan zoo where the animals are difficult to find. I was in Whitehorse in the summer over 35 years ago when a friend lived there. I liked the place, although my memories now are sketchy. I too enjoyed the Follies. A favourite memory is sitting in the Takhini Hot Springs, just outside of town at 11 at night in daylight. I imagine a few things about the town have changed in thirty years. I wouldn't be so sure about things changing that much. Sometimes towns like that just don't change and that is a big part of their charm. Look at the fact that the Follies is still going. You and I saw the same show 35 years apart - it's like time travel. This place sounds a little bit weird (RVs, shows and sternwheelers). But, I guess you always have to find a place like this on a road trip. Couldn't stop laughing with your description and photos of RVs. I have never seen one carrying a golf cars or scooter. That is too funny. I think that is what road trips are all about - finding places which are just a bit off-beat. One day I will do a post on all the bizarre things we have come across in our road trip travels. Glad you found my post amusing. Glad you finally got to see a moose! Totally still counts even though it was a Reserve :D Miles Canyon looks amazing, we'll have to head back to the area to take in that side of the region. You hit the nail on the head when you say it feels like you are wasting daylight. I just felt really guilty going to bed while the sun was still high in the sky - silly really - lol. With 24 hours of sunlight, at least you don't have to worry about vampires! The Frantic Follies looks like a great show. What did the saw/violins sound like? They sounded great. This was the funniest sketch of the show. D and I had season tickets for years to the Sydney Symphony Orchestra at the Opera House and the spoof on that kind of concert was brilliant down to the fact that the musicians always fiddle with the position of their chairs before they get seated. Honestly, if I hadn't seen them myself I would not have believed they were real. This was great to see! We are still thinking that someday we will drive the RV up the Al-Can highway... hoping actually. Always good to see more about it. Love the musk ox, we saw them out in western Alaska. We love road trips and this is one of the greatest but I won't lie, you are going to see a lot of pine trees. I didn't mind them but D got a bit bored after a few days. If you take an RV make sure it is a big one otherwise you will definitely feel left out - lol. Sounds like you had a lot of fun in Alaska, despite the 24-hour daylight. I loved your comments on the American RVs. Yep, Americans like to supersize everything. Alaska was great! I would love to go back and finish the Highway but I'm not sure D feels the same way. I've always dreamt of driving the Alaska Highway, glad I read this article for some good tips! I would love to do that piece of the Alaska Highway between Dawson and Whitehorse. It's the history that interests me more than the wildlife. Your descriptions of the RVs and the people overflowing their seats is spot on! David has a degree in history and he just loved learning about the history of the highway. I confess I did too but sshhhh! -don't tell D.
I had to look on the map to see where you were. I remember when we landed in Anchorage at midnight and it was still light out. Lucky for me, I can sleep when I am tired, so I was fine. Denali is where we saw our first moose. I loved Alaska. I am glad you enjoyed the show. 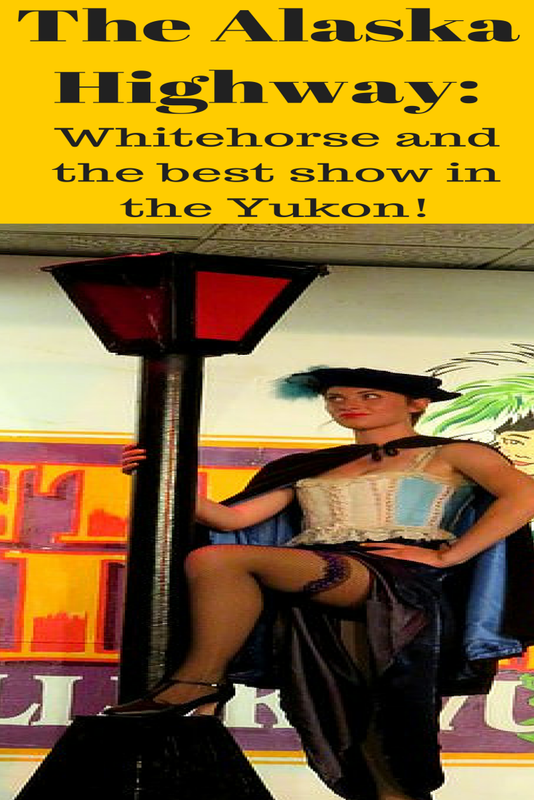 Generally, I don't like vaudeville, but I might give this one a try if I ever find myself in Whitehorse. Of course we would be one of the few in a car. Hubby didn't like driving the camper in New Zealand, and it's small like the ones in OZ. No chance he would be driving one of those behemoths. And - LOL that they tow all those items. David point blank refuses to even consider an RV. I spent my childhood wandering around eastern Australia with my family in a car and caravan so I'm much less allergic to confined spaces on wheels. I would love to give a camper a go but even in NZ D insists on a car and hotels. What some amazing sights you've seen, and no doubt adventures too. Alaska looks beautiful and incredible but it was the RV's and your photos that made me chuckle. There are lots of 'grey nomads' doing the same sort of thing in Australia. You are right about Australia but generally the RV's are a lot smaller. However we were driving back from Perisher last week (last minute skiing trip - long story) and we saw the first one ever in Oz towing a car. I do hope it is not a habit which will catch on. The US have the roads for them - we don't. What an adventure! (I recently met a lady and her husband who have driven from Southern Georgia in the US to Alaska - twice! That's a crazy long drive) And those muskoxen are really unique looking! Wow! D and I love road trips but that is a long way. I've never had much of a yen to visit Alaska, but seeing your photos makes me reconsider. Don't forget there are a lot of pine trees too. The scenery can be stunning but like everyone I tend to publish the best bits and leave out the 'nothing but pine trees' photos - lol. I'm not sure I could handle that much sunlight :/ Those muskoxen do look prehistoric and they certainly do take their RVs seriously! I suppose if you lived in that area you would get used to the sunlight but it would take me a while, although it was fun to experience briefly. I love your RV photos. I admit that I still harbor a North American RV fantasy----but I'll settle for a camper van so we don't have to tow a car or golf cart(?). We visited Whitehorse by taking the old miners' train up from Skagway, Alaska with only some time to go kayaking on a gorgeous lake. I wish I had known about Miles Canyon. It looks gorgeous. I think Miles Canyon is one of those hidden gems. My next post is on Skagway and the drive between it and Whitehorse which goes more or less the same route as the railway. Love all your photos Lyn. Miles Canyon looks amazing. Who knew there were so many types of RV's ... and that they could tow so many different vehicles? We have seen so many gigantic RVs on our travels throughout the states and Canada but when I looked for photos I didn't have that many - probably because it is tricky to photograph them as you pass them on the road. Ahhh one day, I would love to travel across Alaska in an RV too! It seems just awesome, haha! And Midnight Sun was driving me crazy half of the summer in Norway. I'll never get used to it! I'm glad I'm not the only one who gets driven mad by the midnight sun - lol. I hope you get to Alaska one day. We traveled the Alaska Highway in 2009 and saw the same things in Whitehorse as you did. Brought back lots of memories. And, yes, we did it with a 24-foot Class C motorhome, the middle-of-the-road size. Did you get to see the world's largest steam shovel and have chili bowl at Tim Horton's? Oh no - we missed the steam shovel. Now we're going to have to go back - lol. Thanks for evoking some wonderful memories. We travelled the Alaskan Highway in 2006 in August and visited many of the places you mention here. I'm with you - daylight at night is overrated! I also like it dark when it's time to sleep. I'm glad someone agrees with me but the 24 hour daylight thing was interesting to experience. Oh my, Miles Canyon-I am officially smitten! My husband and I have talked about renting an rv to tour this area. Sounds like we're not the only ones with this original idea...Love the photo os the abandoned car, such a great patina on the metal. All I can say is that if you rented a small RV it might be original! We did the Dalton Highway trip from through the Atigun Pass and onto Prudhoe Bay in the Arctic with the North Alaskan Tour Company. Wow! I just checked where that is on google maps. It must have been quite a road trip. It was such a great night, it turned out to be worth that bit of aggravation at the beginning.